The growing dis-connect between a brand and its digital strategy is a key reason many organisations are failing to adjust and implement a clearly defined digital strategy. Without the brand being taken on the journey through the digital transformation process, more brands will be finding themselves lost with little sense of purpose and no value proposition. Digital is blurring the lines between the brand and its customers and, at the same time, accelerating the pace in putting the customer at the centre of the conversation, who they choose to interact with, buy from and build a value with. Marketing has entered the age of the customer, where customers have more information, choices, and power than ever before. The customer experience — the culmination of all brand and customer interactions — now matters more than anything. The growing disconnect between the brand and digital strategy was highlighted in a recent survey by Smart Insights who asked the question, “Does your organisation have a clearly defined digital marketing strategy?” For organisations to suggest digital is either a separate strategy or none at all, pushes the point that has the brand itself become disconnected from its digital future? The issue is not the impact and opportunity digital technology and culture can provide more the fact that digital needs to be moved to the centre of the organisational structure, to not be treated as a siloed strategy but to provide the opportunity to connect to the purpose of why the brand exists. Brian Solis, principal analyst of Altimeter has released a report entitled, The 6 Stages of Digital Transformation suggests the opportunity for success can only be done by listening, interacting and building relationships with your users, your customers and knowing your purpose, why you exist as a brand….Companies need to focus on becoming more Innovative and Adaptive a point in the process where digital is no longer a silo but is how the business operates, in the DNA of its operation. By that it is involving the brand, the purpose and personal traits it promotes to the external environment. Every single brand knows what they do, and some know how they do it, but few brands know why they do it in other words what is their purpose? 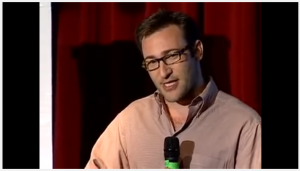 This why, how and what forms the golden circle as described by Sinek. However the issue is most brands start from the outside in for example, what they do and how they do it . 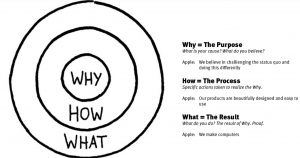 Below is an example of the circle to describe Apple and how, by thinking from the inside out (stating with why) drives a purpose to their existence as a brand. For most brands, they start from the outside in…but don’t get to their purpose. Applying this logic may be an indicator as to why digital strategy is disconnected from the brand and its purpose and why in many cases being driven by data alone exists a reason for the disconnect and the growing gap between a brands purpose and the digital tactics applied. Red Associates, an innovation and strategy consultancy promote the need for more time and resource given to thick data, that is data generated by ethnographers and anthropoligists that focus on human behaviours more. A lot of time spent is on the big data, the analytics insights, the insights that perhaps provide short term gain whilst at the same time not thinking about the actual users, the customers and the purpose of what you as a brand are providing users. Rather than data modelling alone, organistions need to be blending both the big data with thick data, that qualitative insights to help provide a more deeper understanding of the brand and its purpose. The use of thick data is becoming even more essential as we move to the age of the customer, a phrase coined by Forrester and supports the growing movement of “empowered customers shaping business strategy. Customers expect high value digital experiences and will go elsewhere to a competitor if you can’t service and meet their requirements”. Brands should not be treating their digital strategy as a mix of tactics (e.g. search, social media, content marketing, etc). Instead, think of digital as a part of the lifeblood of the organisation. 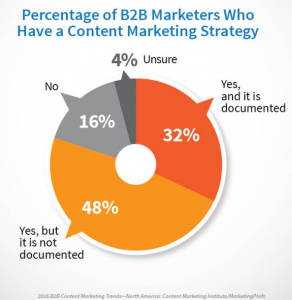 According to Hubspot, 71% of marketers were creating more content than in 2014, but according to the chart above there seems to be a disconnect between why this content is being created and for what purpose? We are obsessed by what is new and what new channels and tactics to jump head first into and this can be a huge distraction when there is not clearly defined strategy or brand purpose. In reality there is a severe lack of taking a step back and thinking about core objectives and target audience. Focus on this and most everything else falls into place.